France in London | Fashion Trends Autumn/Winter 2009: The future looks bright! 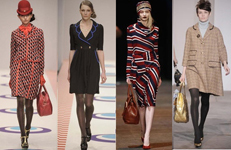 Fashion Trends Autumn/Winter 2009: The future looks bright! Notably, it was the first time in 25 years that an entire day was devoted to men's fashion. Masculinity (thank you Mr Beckam) is no longer defined by a lack of personal hygiene and disinterest in ones appearance. So, why keep on excluding men from fashion? The British Fashion Council took the issue seriously and created a special day to show off 13 new and up-coming UK menswear designers. Great idea! So, what was to be noticed during the last London Fashion week? Colours are back! Everywhere! Happy shades that made some catwalks resemble a box of crayola pencilas-in a good way.The best example was House of Holland's collection: model Agyness Deyn certainly carried off the numerous happy shades! A/F 09 colours will definitely be orange, blue, purple, rosa and ...kaki, which finally seems to have made its fashion come-back. I'm sure Paul Smith will concur. Retro chic has been top of the fashion Hot List for a while now, but, this time, it got a touch of American style. Jackie O. is your new inspiration source. 30s' and 60s' are back on the catwalks! Carla Bruni, who compares herself to Jacky O. and who is a retro chic style supporter, will be happy. At the exhibition, designer Suwha was to be noticed in particular. Catwalks offer some good creations as well. - One shoulder or bustier à la Issa, Erdem and Marios Schwab. Preppy school princesses have gone Bad: Luella, Vivienne Westwood, Paul Smith and Mullberry were all channelling naughty school girls to achieve autumn's cool new military-meets-school uniform-meets English heritage trend blend. Preppy girl from last season went darker and more masculine. Do you recognise her? Didn't you feel, occasionally during Fashion Week, as if you were bording a plane? It seems the newest source of inspiration is flight attendents. Quite understandable since this outfit has an undeniable class which always make people dream (or maybe even fantacise?). Jackets are simply everywhere: next season, don't forget yours! 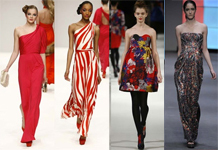 London Fashion Week A/F 09 loves curves! Such a scoop! A whole year has gone by with skirts ruling the fashion playground, but, this time it seems that dresses are taking their revenge! They were simply everywhere. Fashion loves playing with contrast and the new collections are no exception. This season, designers have not been afraid of mixing rich and poor, shiny and matt, light and heavy matters. Results are always surprising! Facing the credit crunch, designers didn't have the same reaction at all. Some of them chose provocation whilst others decided to recycle! Young designer AVSH Alom Gur put 'Credit Crunch' sequinned slogans all over his collection... A bling-bling response to the crisis! 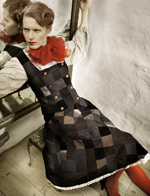 In contrast, Estonian designer Reet Aus showed at the exhibition a range of creations made from upcycled trousers and men's shirts that she collected. Reet Aus made her London Fashion Week debut this February at Estethica - the ethical fashion section of LFW. The other part of her collection was purely organic. A designer connected with the issues of the day: how can we not appreciate her work?